This is a weekly column from freelancer Rowan Kaiser, which focuses on "Western" role-playing games: their stories, their histories, their mechanics, their insanity, and their inanity. This week Rowan explores the one-year anniversary of Skyrim, a game that - despite critical and commercial success, including a 5-star review from Joystiq - he still can't get a good handle on. 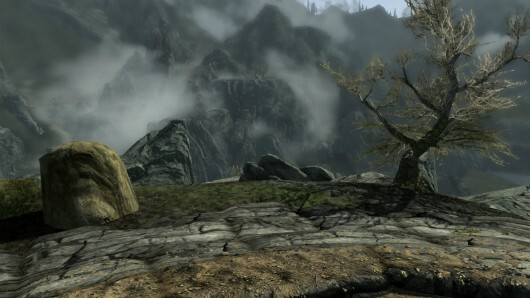 The Elder Scrolls V: Skyrim hit the first anniversary of its 2011 release this month. Despite a year's worth of play, criticism, mods, and add-ons, I still don't have a good handle on Skyrim in its entirety. It's a game that I'm happy to have played, and recommend highly to anyone who might enjoy it and can afford it. But it's also a game that I give up on fairly quickly, every time I start a new character. The reason I want Skyrim to hold my interest is because I have a strong, positive gut reaction to much of what Skyrim does. Some of my favorite occasions in games occur when you come to an overlook and catch a moment of sheer beauty. When you wander into a snow-covered town and the music gently plays in the background. When game systems combine and something new emerges from what had been previously predictable. In these moments the experience feels just right. Moments like this help to enhance the experience, unfolding into something grand. And Skyrim is full of these occasions. Bethesda's latest title in the longstanding franchise has the relative beauty of Ultima VII, the magic of Daggerfall, and the emergent narrative of Far Cry 2. I get sequences in Skyrim where I'm faced with an impending dragon attack, introducing a beast much too powerful for my character. Worried about my survival, I duck into a tomb for safety only to be greeted by the most powerful undead adversary I've yet to meet. Stuck between both, and at the edge of a cliff, I fall and hope to catch tiny ledges on my way down. If I survive, the music calms and I can limp into town to lick my wounds and consider my next step. Struggling with The Elder Scrolls V: Skyrim one year later originally appeared on Joystiq on Fri, 30 Nov 2012 18:15:00 EST. Please see our terms for use of feeds. 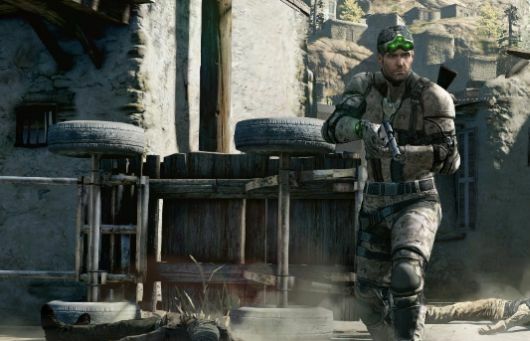 From the art of the choke, to the art of the non-lethal kidney poke, this latest trailer for Splinter Cell: Blacklist shows how Sam Fisher takes 'em out without making much noise. Ignore the fact that Fisher has a silencer on his pistol, that'll just complicate this conversation. Ghosting seems quieter. Splinter Cell: Blacklist video showcases non-lethal abilities originally appeared on Joystiq on Fri, 30 Nov 2012 16:45:00 EST. Please see our terms for use of feeds. 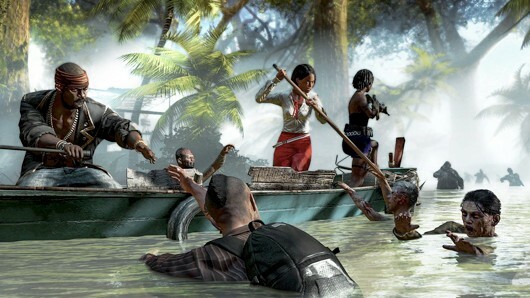 Dead Island: Riptide, like the original Dead Island, won't be released in Germany, home base of publisher Deep Silver. Riptide creative producer Sebastian Reichert said at Gamescom he "wouldn't bet" on the game being available in Germany, but now he's stated it officially. "We have no censored version of the game," Reichert told PCGamesN. "So we cannot release it in Germany. It feels f*cking awkward to have one of the most successful games in years and nobody in your country knows it." We double-checked with publisher Deep Silver to make sure there wasn't anything lost in translation and a company representative confirmed Riptide wouldn't be available in Germany. The Unterhaltungssoftware Selbskontrolle (USK) must follow government-enforced criteria that, along with other elements, note a game can't have extreme violence against human-like enemies. Under a microscope, the USK's determination of such things can get awfully fiddly. It was a surprise back in 2011 when Epic's Gears of War 3 passed the censors, while no other installment in the series had made the grade. It wasn't just a surprise to us, but to Epic itself. Dead Island: Riptide not washing up in Germany originally appeared on Joystiq on Fri, 30 Nov 2012 13:45:00 EST. Please see our terms for use of feeds. The biggest bit of news this week is the release of the Wii U in North America. The first 8th generation home console managed to sell 470,099 units in its first week. Hardware sales more than doubled week on week and are up across the board. However year-on-year sales are a different story. Every platform was down and overall sales are down 31 percent year-on-year. Five games debuted in the top 30 this week. 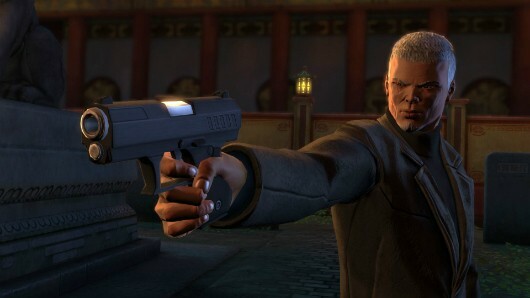 Hitman: Absolution (PS3) debuted at number six with sales of 501,081. The Xbox 360 version debuted at number seven with sales of 488,127. Software milestones this week in the top 30: Call of Duty: Black Ops II (X360) passed the seven million mark; Call of Duty: Black Ops II (PS3) passed the five million mark. Halo 4 (X360) passed five million units sold; Kinect: Disneyland Adventures (X360) passed the one million mark; Animal Crossing: New Leaf (3DS) passed the one million mark; Super Mario 3D Land (3DS) passed the seven million mark; Uncharted 3: Drake’s Deception (PS3) passed the five million mark; and NBA 2K13 (X360) passed the one million mark. 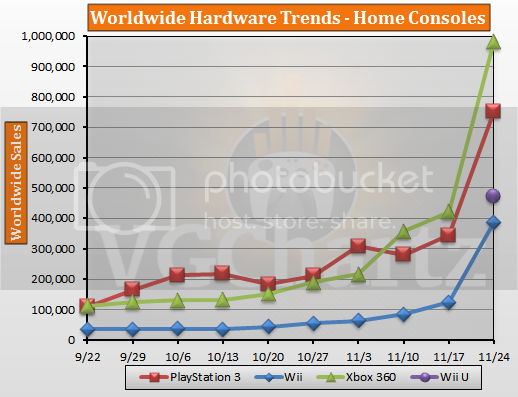 Hardware home console sales week on week are up across the board. Xbox 360 sales are up 561,268 (133%) to 982,471 units sold. 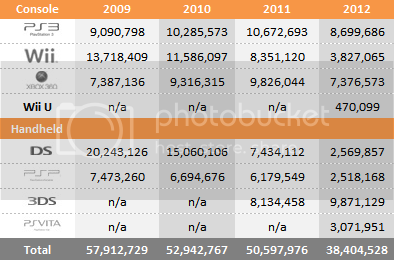 PlayStation 3 sales are up 408,099 (119%) to 752,337 units sold. The Wii U sold 470,099 units in its first week. The Wii sold 387,463 units, which is up 264247 (214%). Handheld sales are up across the board week on week. The 3DS sold 615,127 units, which is up 206,919 (51%) week on week. The PlayStation Vita is up 97,404 (95%) to 200,397 units sold. The DS is up 242,650 (269%) to 332,879 units sold. 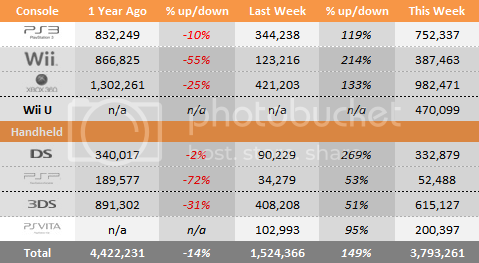 The PSP sold 52,488 units which is up 18,209 (53%) compared to last week. Total week on week sales are up 2.27 million (149%) to 3.79 million units. No platforms were up year-over-year. 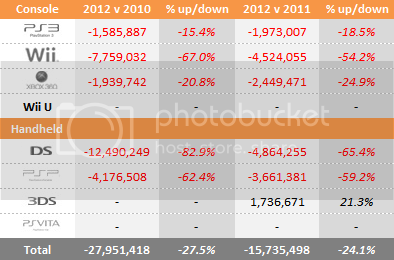 The PlayStation 3 is down 79,912 (-10%), the Wii is down 479,362 (-55%), and the Xbox 360 is down 319,790 (-25%). 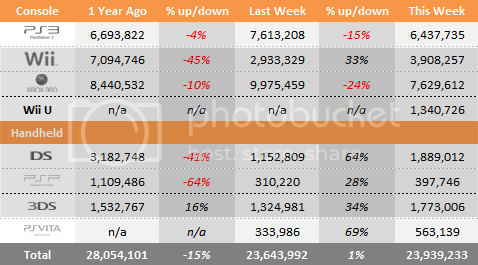 The PSP is down 137,089 (-72%), the DS is down 7,138 (-2%) and the 3DS is down 276,175 (-31%). Year on year sales are down 628,970 units (-14%). The Xbox 360 has outsold the PlayStation 3 for the fourth time in 2012 and for the third week in a row. The Wii U had a strong debut, especially since it is only available in North America. The Xbox 360 has a 46 percent market share; the PlayStation 3 has a 35 percent market share; and the Wii has an 18 percent market share. Compared with ten weeks ago all three home consoles are up. The Xbox 360 is up nearly 10 fold, the PlayStation 3 nearly eight fold and the Wii up 11 fold. 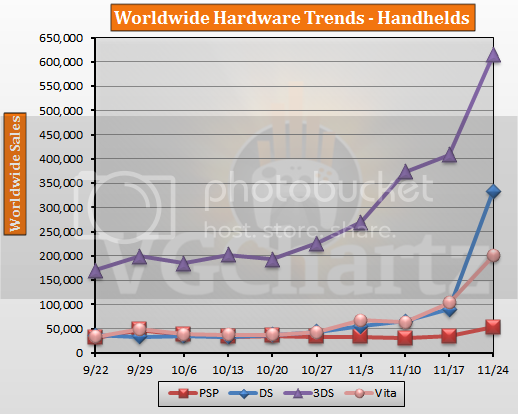 3DS hardware remains well above its rival, the PlayStation Vita, outselling it by more than 3 to 1. The 3DS has outsold its predecessor, the DS, by more than 6 to 1. The PlayStation Vita has nearly outsold its predecessor, the PSP, by nearly 4 to 1. The DS has an 86 percent market share this week for the 7th generation handhelds and the PSP has a 14 percent. The 3DS has a 75 percent market share for the 8th generation of handhelds, while the Vita has a 25 percent market share. Compared with ten weeks ago all four handhelds are up. The 3DS is up nearly four fold, the DS more than nine fold, the Vita by six fold and the PSP by less than two fold. Five games debuted in the top 30 this week. Hitman: Absolution (PS3) debuted at number six with sales of 501,081. The Xbox 360 version debuted at number seven with sales of 488,127. The game launched in North America and Europe. New Super Mario Bros. U (WiiU) debuted at number 10 with sales of 372,169. The game launched in North America. Nintendo Land (WiiU) debuted at number 11 with sales of 353,625. The game launched in North America. PlayStation All-Stars Battle Royale (PS3) debuted at number 22 with sales of 176,580. The game launched in North America and Europe. Disney Epic Mickey 2: The Power of Two (Wii) debuted at number 27 with sales of 150,847. The game launched in North America and Europe. Here are the other games in the top 10 that are not debuts: Call of Duty: Black Ops II (X360) is at the top of the charts with sales of 1.24 million units. Call of Duty: Black Ops II (PS3) is at number two with sales of 1.18 million units. Kinect Adventures (X360) is at number three with sales of 615,283. Halo 4 (X360) is at number four with sales of 607,817. Just Dance 4 (Wii) is at number five with sales of 569,302. Assassin’s Creed III (PS3) is at number eight with sales of 471,345. Assassin’s Creed III (X360) is at number nine with sales of 402,324. 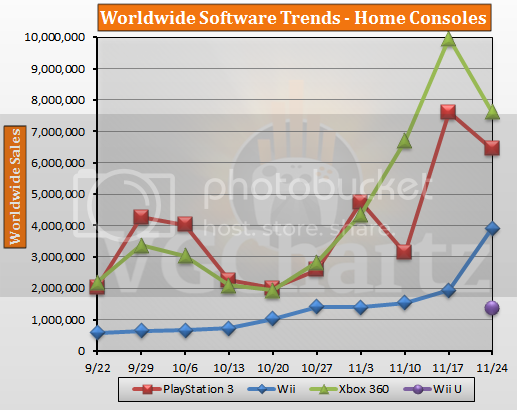 Week on week software sales for home consoles are up for the Wii, and down for the PlayStation 3 and Xbox 360. The Xbox 360 sold the most games this week with sales of 7.63 million, a decrease of 2.35 million (-24%). The PlayStation 3 sold 6.44 million games this week, a decrease of 1.18 million (-15%). Wii software sales are up 974,928 (33%) to 3.91 million games sold. The Wii U sold 1.34 million games in its first week. 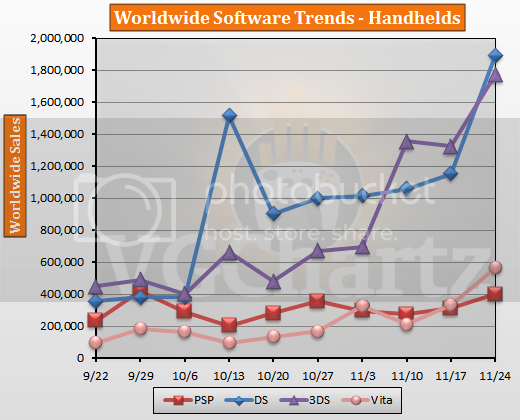 Handheld software sales are up across the board week on week. The DS sold 1.89 million games, an increase of 736,203 games (64%) week on week. The 3DS sold 1.77 million games, which is up 448,025 (34%). The Vita sold 563,139 games, an increase of 229,153 (69%). PSP game sales are up 87,526 (28%) to 397,746 games sold. Total combined software is up 295,241 units (1%) week on week to 23.94 million. Year on year software totals are up for the 3DS and down for everything else. The PlayStation 3 is down 256,087 (-4%), the Wii is down 3.19 million units (-45%) and the Xbox 360 is down 810,920 units (-10%). 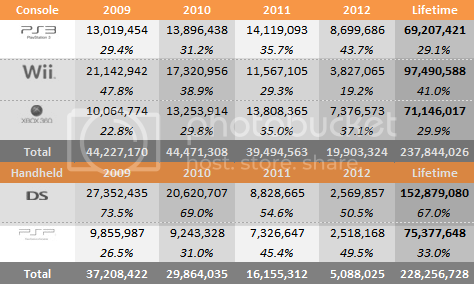 The DS is down 1.29 million units (-41%), the PSP is down 711,740 units (-64%) and the 3DS is up 240,239 units (16%). Total combined software is down 4.11 million units (-15%) games sold year on year. After the release of Call of Duty: Black Ops II last week, the Xbox 360 and PlayStation 3 are both down. The Xbox 360 has led for the third straight week and for the fifth time in 10 weeks. The PlayStation 3 led for the other five weeks. The Xbox 360 has a 42 percent market share, the PlayStation 3 with 36 percent, and the Wii with 22 percent. Compared to ten weeks ago all three home consoles are up. The DS sold the most software this week. It has led for five of the last 10 weeks. The 3DS led for the other five weeks. The DS has an 83 percent market share for the current generation handhelds and the PSP has a 17 percent market share. The 3DS has a 76 percent market share for the next generation handhelds, while the Vita has a 24 percent market share. Compared with ten weeks ago the all four handhelds are up. The Top 100 can be seen below or click here to view the full chart. Rage is shortly receiving new DLC over a year after release, if a trophies listing is accurate. PS3Trophies.org reports ten new trophies are being added to id Software's shooter, five of them based around a new job path called 'The Scorchers.' Another trophy is for finishing the campaign on 'Ultra Nightmare difficulty,' suggesting the DLC includes a new difficulty level even tougher than plain ol' Nightmare setting. The trophies are backed up by a PEGI listing from earlier this year for 'Rage: The Scorchers,' content rated for Xbox 360, PS3, and PC. 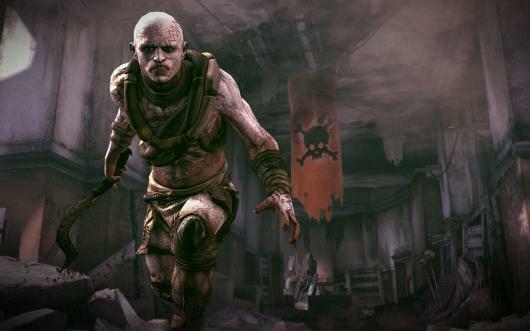 id Software founder John Carmack has also said mod tools which were supposed to ship with Rage were coming to the game "soon." It's just speculation, but if the DLC is accurate it may coincide with their release. We've reached out to Bethesda for confirmation of the DLC. Rage is getting 'The Scorchers' DLC soon, new trophies suggest originally appeared on Joystiq on Fri, 30 Nov 2012 09:30:00 EST. Please see our terms for use of feeds. You probably remember the day that your best friend died on the field of battle in XCOM: Enemy Unknown. One of the coolest features of the Firaxis-developed remake is the ability to customize the names of individual soldiers that make up your army of alien-stompers, fostering a strong connection that adds weight to a soldier's permanent demise. It's unexpected, then, that for its first downloadable content in the rebooted XCOM universe - dubbed 'Slingshot' - Firaxis has decided to create a completely fictional character as its star. Zhang is a member of the Chinese Triad who defects over to XCOM when he comes to recognize the magnitude of the threat that the world faces. He's introduced in Slingshot's first mission via cutscene, a heavily scarred, besuited tough guy who stands as motionless as the Foo Dog statues that surround him. The Triad defector is a civilian in the first mission, a neutered unit that must be escorted by XCOM forces to a nearby evac location situated close to your Chinese cemetery rendezvous point. Alien forces attack from all sides, same as it ever was, and only tactical thinking sees you through. You'll probably think more than once "Why can't I just hand this Triad fellow a gun and tell him to point it at the invaders?" That opportunity comes later, as Zhang's defector status puts him on the outs with his former bosses. Complete the first Slingshot mission and your Triad buddy joins XCOM as a Heavy. He's just like any other soldier save for the fact that his name and appearance are locked. You don't even need to bring him along on the two Slingshot missions that follow, though his high stats might compel you to do so anyway. Assaulting an alien battleship as a Triad defector in XCOM: Enemy Unknown's 'Slingshot' DLC originally appeared on Joystiq on Fri, 30 Nov 2012 08:00:00 EST. Please see our terms for use of feeds. Have you ever been playing a Spider-Man game and thought to yourself "Man, this game is great, but would be much better with JETPACKS."? Well, your dreams have come true, as that's exactly what Happion Laboratories' Energy Hook appears to be. Led by Spider-Man 2 technical director Jame Fristrom, who created the game's swinging mechanic, Energy Hook is a game that combines the "swinging and parkour from games like Spider-Man 2, Prototype andBionic Commando mixed with the racing and trick challenges of SSX or Tony Hawk." Fristrom is joined by Paul Whitehead, who contributed art for Spider-Man, Sly Cooper, and Guild Wars. It's everyone's favorite toy this holiday season: My Little Inferno. The world is getting colder by the day and the only thing keeping everyone warm in their houses is burning whatever they can get their hands on. Brilliantly, the game starts off with you burning the instruction manual for My Little Inferno in order to get your first set of funds. As you work through the catalogs of consumer goodies to set ablaze your only contact with the outside world comes from letters delivered along with your packages: a weatherman telling you about the dire state of the snowy landscape outside, a representative from the Tomorrow Corporation that sold you the My Little Inferno, and notes from a neighboring girl. The first two give some useful background information and global updates but it's the interactions with the neighbor that become the most interesting. How her story plays out and the final moments of the game are the high points of the entire experience, it's just a shame that the story doesn't play a greater part in the gameplay, but more on that later. The controls use the touch screen on the gamepad, which works well except for the fact that it forces you to stare at the miniature screen instead of the TV. That turns out to be a slight benefit, though, because the game actually looks prettier and features fewer blemishes on the smaller screen. Overall the visuals are interesting and there's plenty of style (the almost-horrific nature of some of the things you can buy, like a creepy-looking bug-eyed rabbit doll with terrible teeth, is great), but there are noticeable issues, including a framerate that grinds to a glorified slideshow when you start burning too many things at once. When you're looking at your fireplace your touch becomes a flame that lights up anything combustible nearby, and this is how you'll spend the bulk of your time. As I alluded to earlier, the gameplay is a simple matter of buying things from a catalog and burning them to get more money to buy more things to burn, and so on and so forth. Different items have different visual, sound, and special effects, like freezing everything nearby, pulling everything into a gravitational pull, or even a marshmallow that gains sentience only to run around screaming as it's incinerated. Finding out what each item does as you light it up is interesting, but there's no real strategy because the special effects never really change anything. No matter what happens in the fireplace you'll still get the same amount of money from the individual items you put in, along with any spiders that happen to crawl inside. This is the main problem with Little Inferno - there's a complete a lack of strategy or meaning to what you're doing. Advancing through the game is just a matter of buying everything in a catalog and then getting enough money to buy the next one (up to a total of six). Your only challenge is to find enough combinations to be able to buy the next catalog. Combinations are pre-defined from a list and your only hint is based off of the name of each of them. For example, for the “Elderly Couple” combination you might buy an old adventurer doll and a doll of an older woman, then burn them together to get credit for the combination (as well as some tickets and money). But while these are combinations according to the game, the two dolls don't actually do anything different when burnt separately or together, which takes away a potential sense of wonder that would encourage experimentation. They feel less like meaningful combinations and more like arbitrary couplings made up by the developers. If the two dolls, say, held hands and looked like a couple before they were lit up, it would make the hunt for combinations much more fulfilling. The other major problem with Little Inferno is that the story feels completely separate - almost disjointed - from the gameplay. The idea is that everyone is at their My Little Inferno fireplace burning everything in order to stave off the freezing temperatures outside, but the gameplay offers no sense of urgency. You're just burning things for the sake of it. Something like a life meter constantly ticking down as you get closer to hypothermia could have led into some kind of deeper strategy, but there's nothing like that in the game. Stranger still is that if there's no reason to manage time, why do some items take longer to get to you than others? Everything has a shipping time, but without some impetus for me to constantly keep burning it's just a pointless metric. You can use tickets to expedite the shipping but you'll burn through them quickly if you use them all the time and I'm still left wondering why the wait time exists in the first place. It's rarely a good sign when I'm watching youtube videos while I wait for the game to progress. It makes me wonder how quickly I could have beaten Little Inferno if the developers hadn't put this artificial time filler into it, but as it is Little Inferno took me two hours and 45 minutes to complete. Little Inferno is one of the strangest games I've ever played. All you do is sit in front of a fireplace buying things from a catalog and then burning them to get more money. It felt like there was a fantastic puzzle game just waiting to burst out - and there's certainly an intriguing narrative and backstory - but as it is it's more like an app you mess around with aimlessly for no apparent reason. If you're a pyromaniac you're probably going to buy it anyway, just make sure you have easy access to something entertaining for when your Little Inferno loses its luster.